Denkmal – when you walk around in Berlin, you’ll notice this word keeps appearing on buildings, in museums and at churches. The English translation of the word, which is understandably so important to Berlin, is Memorial. There are many reminders in the city of the terrible destruction wrought by World War II, and one of the more poignant of these is the reconstructed Kaiser Wilhelm Church, which sits in the middle of what is now a busy shopping street in the Charlottenburg-Wilmersdorf neighborhood. The church was built in 1891-1895 in the Romanesque Revival style, and it was an important Protestant church for the city’s residents. 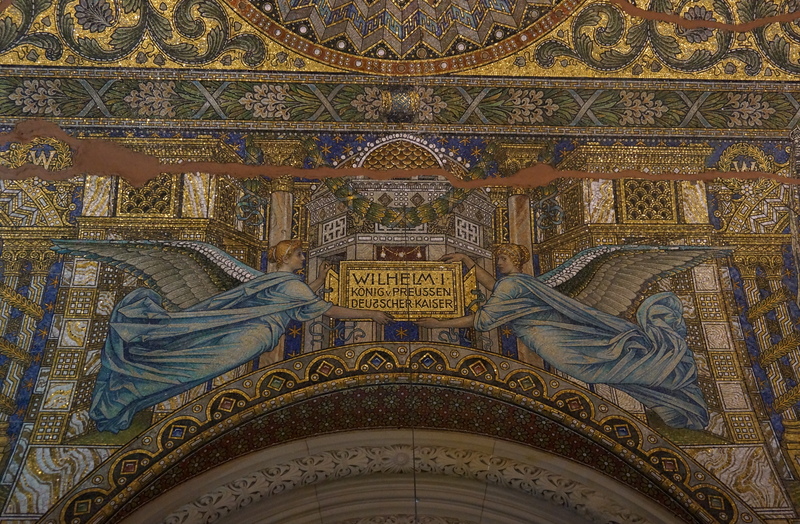 Since it was commissioned by Kaiser Wilhelm II to honor his grandfather, Kaiser Wilhelm I, who was the King of Prussia and the first German Emperor, it was unusually ornate, and decorated with intricate mosaics depicting important events in the history of the Hohenzollern royal family. In 1945, the church, along with most of Berlin, was badly damaged during the allied air raids of the Battle of Berlin. In 1959, plans were made for a new church on the site. Locals insisted that the ruins of the original church should be integrated into the new design, to serve as both a monument to peace and as a reminder of the will of Berliners to rebuild their city after the war. As a result, It remains a moving memorial, as well as a vivid reminder to remember the past, so that we will never, ever repeat it.